The dust hasn't even settled yet on the revelation that the CIA, in spite of years of denials, kept a top-secret file on world-renewed thinker and academic Noam Chomsky. Now, a recent speech given by the 84-year-old intellectual has surfaced, in which Chomsky labels the United States fundamentally undemocratic. Pennsylvania-born Chomsky delivered the speech at a German media forum. Chomsky, professor emeritus at MIT and voted the "world's top public intellectual," has previously lambasted the American free press, criticized state-run capitalism, and spoken about the failures of America's foreign policies. He told guests that America's supposed "democracy" was inherently false because the country was run by a paper-thin minority, and that the U.S. had flourished by keeping the majority of its participants in the dark about important policies. Chomsky added that keeping one's population largely in the dark was traditional of so-called "democracy," and is well-examined in political science. The "herd" must remain "bewildered". The reasons were explained lucidly by the professor of the science of government at Harvard — that's the official name — another respected liberal figure, Samuel Huntington. As he pointed out, "power remains strong when it remains in the dark. Exposed to sunlight, it begins to evaporate". Bradley Manning is facing a life in prison for failure to comprehend this scientific principle. Now Edward Snowden as well. And it works pretty well. If you take a look at polls, it reveals how well it works. Chomsky also attributed President Obama's 2008 election win to good PR tactics. So for example, after Obama's election in 2008, a couple of months later the advertising industry had its annual conference. Every year they award a prize for the best marketing campaign of the year. That year they awarded it to Obama. He beat out Apple computer, did an even better job of deluding the public — or his PR agents did. If you want to hear some of it, turn on the television today and listen to the soaring rhetoric at the G-8 Summit in Belfast. It's standard. He goes on to say that democracy is made more powerful and resonant by a two-party state, but that America was a single-party state. The Republican Party, he said, didn't really count. In the past, the United States has sometimes, kind of sardonically, been described as a one-party state: the business party with two factions called Democrats and Republicans. That's no longer true. It's still a one-party state, the business party. But it only has one faction. The so-called American free press, Chomsky said, is "free" by name only. The reason given for the NSA's surveillance programs, he said, was the threat of terrorism — but terrorism, he added, was made abundantly more likely by America's foreign policies. One of the striking examples was the invasion of Iraq. U.S. and British intelligence agencies informed their governments that the invasion of Iraq was likely to lead to an increase in terrorism. They didn't care. In fact, it did. Terrorism increased by a factor of seven the first year after the Iraqi invasion, according to government statistics. Right now the government is defending the massive surveillance operation. That's on the front pages. The defense is on grounds that we have to do it to apprehend terrorists. If there were a free press - an authentic free press - the headlines would be ridiculing this claim on the grounds that policy is designed in such a way that it amplifies the terrorist risk. Chomsky pointed out that if policies are supported by most of the public, and yet voted down by government — as we saw when the gun-control debate peaked — it cannot technically call itself democratic at all. The study of attitudes is reasonably easy in the United States: heavily-polled society, pretty serious and accurate polls, and policy you can see, and you can compare them. And the results are interesting. In the work that's essentially the gold standard in the field, it's concluded that for roughly 70% of the population - the lower 70% on the wealth/income scale - they have no influence on policy whatsoever. They're effectively disenfranchised. As you move up the wealth/income ladder, you get a little bit more influence on policy. When you get to the top, which is maybe a tenth of one percent, people essentially get what they want, i.e. they determine the policy. So the proper term for that is not democracy; it's plutocracy. 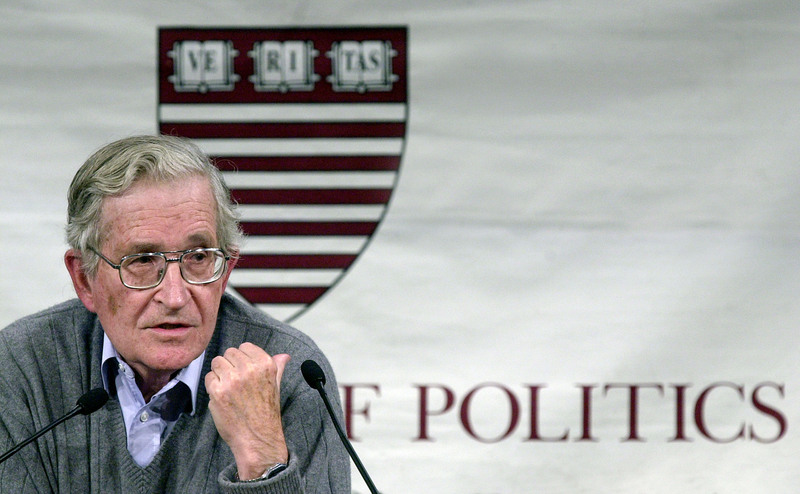 Chomsky also pointed fingers at the rest of the Western world, saying that the disappearance of democracy inside of Europe is "so outlandish," and "much worse." You can watch the taped speech here.